YEAH at last and about time! The meatilicious weekend I’ve been waiting for! Grillstock, celebration of all things barbeque in the sweet-smoked baby-back Bristol-town. I’ll take any excuse for a long weekend in a lovely hotel in one of my favorite towns in the South of England. After a long four day week at work I nestled into my seat in the ever-crowded cattle-class on the Great South Western and breathed a sigh of relief. A booked seat was especially important since there was a breakfast beer waiting and I wasn’t prepared to swig from the bottle in the aisle like an animal! 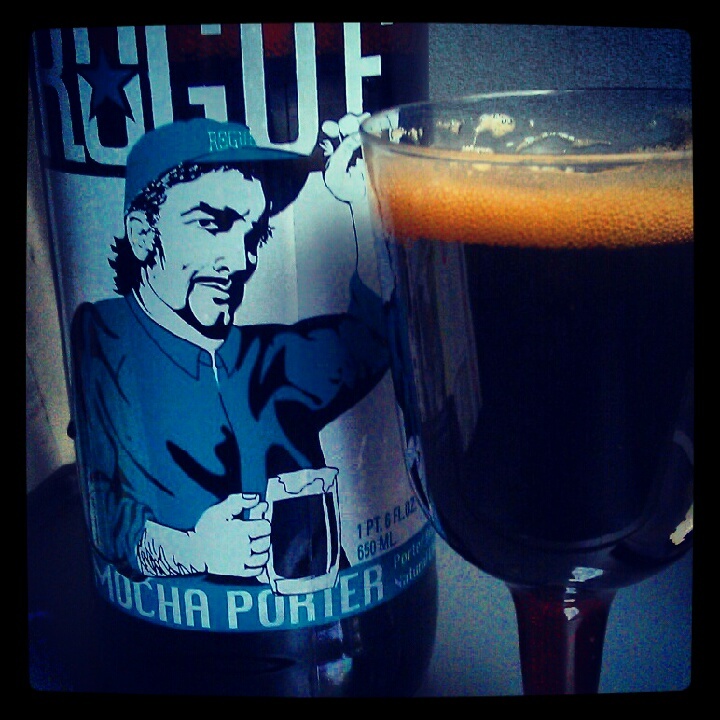 To accompany my pulled-pork breakfast burrito, there was a Rogue Ales Mocha Porter I was anxious to get open (around 5%ABV – I lost interest trying to convert from 13 Plato). I appreciate that in keeping with the meaty yankie theme of the weekend, their Bacon Maple ale would have been more fitting but I still haven’t found one and coffee beer is now a train-journey tradition. Prizing off the lid, the aroma of bready, yeasty, overripe banana aromas was unleashed on the unsuspecting passengers but rather than looks of jealousy there were just the usual confused, disappointed faces glancing suspiciously. It’s mine anyway – I’ll share with the OH and that’s it. Oh and that friendly-looking chap on the bottle? He looks like somebody you might share a beer with too. Poured out into my no-expense-spared Poundland picnic goblets, it was a muddy, deep, dark cloudy brown with a foamy crema any barista would admire. The light carbonation opened up the flavour to a woody, roasted, malty, bitter-sweet smoothness. Subtle hops play in the background as the coffee is gradually dialled up to a warming after-taste with a slight sharpness. What a lovely little wake-up drink to send me on my way for a jolly fun weekend. Train journeys are always made delightful with a tasty beer and besides, the OH is a Geordie so train-drinking is part of his culture. So we arrive in Bristol refreshed and ready for a weekend of food, drink, good friends and good times… See what we got up to later this week!